How do you Measure the Performance of your Service Providers? Effective facilities management is proven to deliver real benefits to organisations in terms of reducing costs and attracting and retaining customers. However it is an extremely competitive and fast-changing market. Property Developers and Managers need to be continually improve the quality of their facilities and services while keeping costs low. Property Developers usually enlist the services of multiple service providers to provider multiple services as part of facilities services. These include guest (Visitors Management Services) outsourced to security service providers together with protective security services, cleaning and Maintenance services. Service providers are usually contracted independently for a given term. Difficulty in accounting for the footfall of all individuals accessing your facilities (visitors and residents). Such data is necessary inputs required to measure the utilization of your property resources such as energy, water, sanitary supplies etc. Objectively measuring the performance of service providers. For instance how do you ensure that the security guard tours and patrols conducted by security services providers meet and comply with minimum service level requirements? Minimizing costs attributed to oversupply of services or costs risks raised by under provision of the same services. To bridge the gaps above, property developers and facilities managers need intelligence and information regarding the performance of services provided by their contracted services.Such information will help them identify and highlight risks before they escalate. It also helps them continually improve the quality of their facilities and service operations to meet customer needs. It best if independent sources are leveraged on for such data since It is difficult to get objective and correct data and information from the service providers themselves. Identigate integrated Solutions is at the forefront working with both facilities managers and service provides by delivering and implementing effective technology platforms that meet the needs of both the facilities managers and service providers. 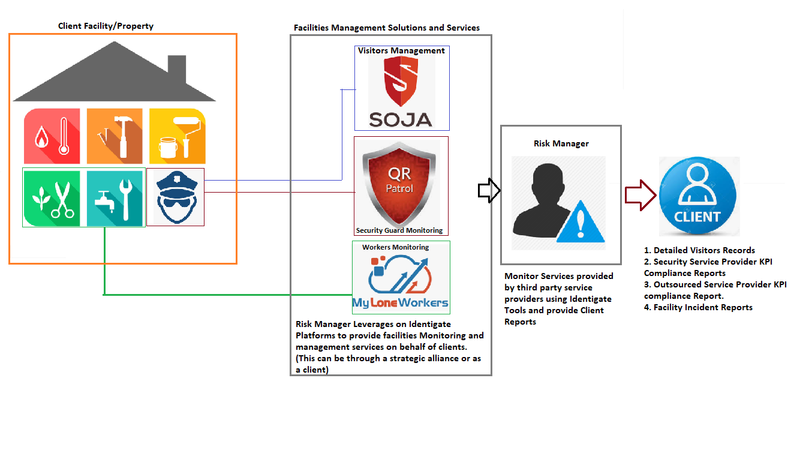 Soja is a Mobile and Web technology platform that reinforces security with a digital visitor, residents and incident management system. Soja empower you with real time statistics and data on who accesses your facilities. The simplicity and effectiveness of Soja will be a sure hit for your visitors and residents. QR-Patrol is an online guard tour and patrol monitoring system which helps organizations worldwide manage and monitor the patrols and activities of their personnel in an innovative way. QR Patrol allows facilities managers to effectively access and monitor security operations within their properties. The elimination of data lag between what occurs on their sites and accessing such crucial information and data empowers them with better control of both their facilities and the contracted service providers. MyLoneWorkers is a real-time and online system designed especially to help companies monitor their Lone Workers leading to more efficient management in an innovative way. A Lone Worker is an employee who performs an activity that is carried out in isolation from other workers without close or direct supervision. Lone workers may include cleaners, maintenance engineers etc. We are on the lookout for strategic alliance with smart service providers who can bridge the gap by providing monitoring services on behalf of facilities managers and service providers by leveraging on our technology platforms. Thinking of Joining us in this journey? Get in touch today. Comments are closed, but <a href="http://www.identigate.co.ke/2019/03/10/facilities-management-observatory-services-an-unexplored-niche/trackback/" title="Trackback URL for this post">trackbacks</a> and pingbacks are open.